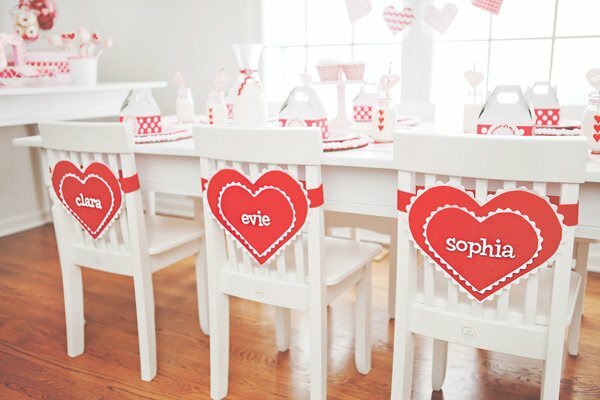 Continuing our love-filled day devoted to bringing you some of the best Valentine’s Day parties around, here’s an especially charming one that’s sure to deliver a hefty dose of inspiration! 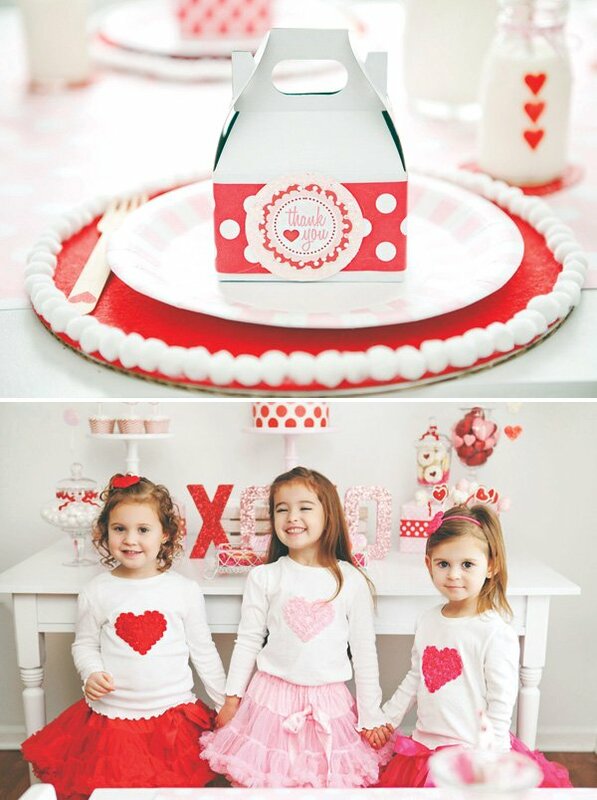 Amy Grout of SmashCake & Co. cooked up this lovely Kisses & Cupcakes Valentine’s Day Party for some adorable, pint-sized party guests, who looked too darn cute in their coordinating rosette heart shirts and pettiskirts! 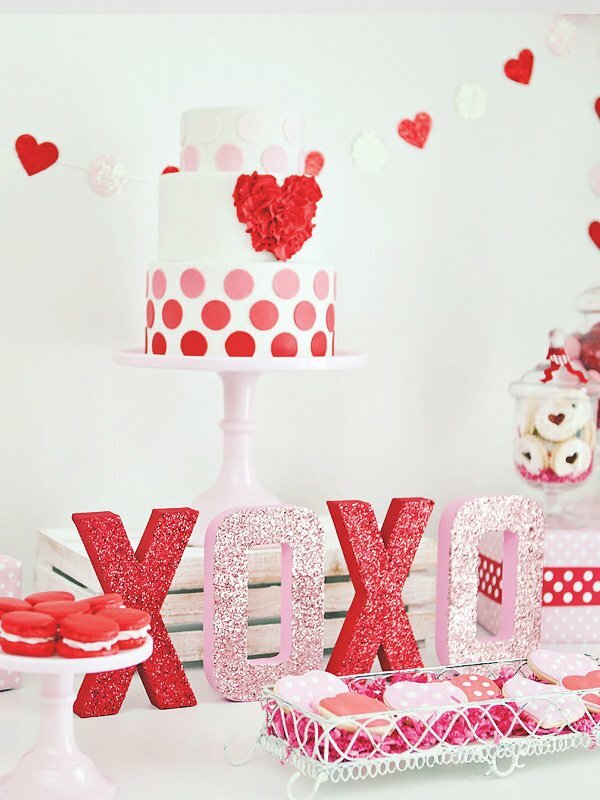 Fabulous ruffled heart & ombre polka dotted cake + matching rosette heart shirts for the guests! 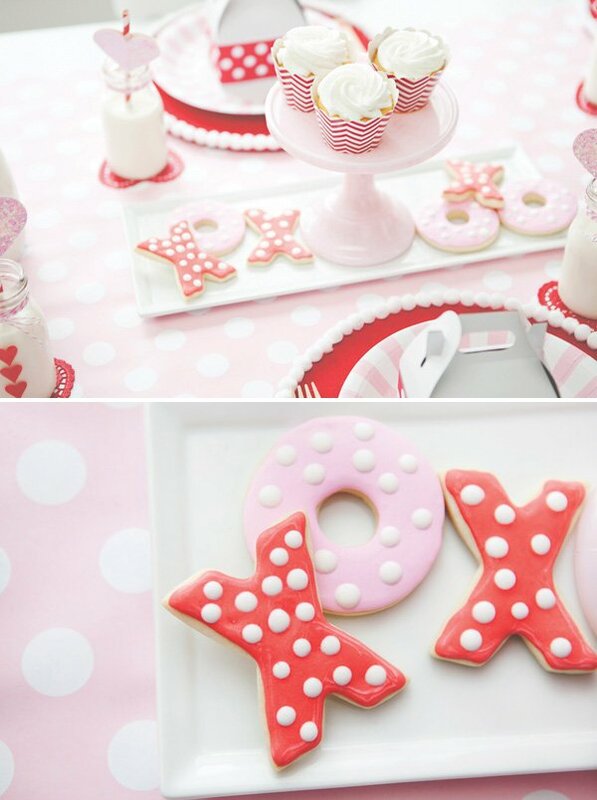 Two of the best things about Valentine’s Day are “Kisses & Cupcakes”… and this Valentine’s Day party had plenty of both! 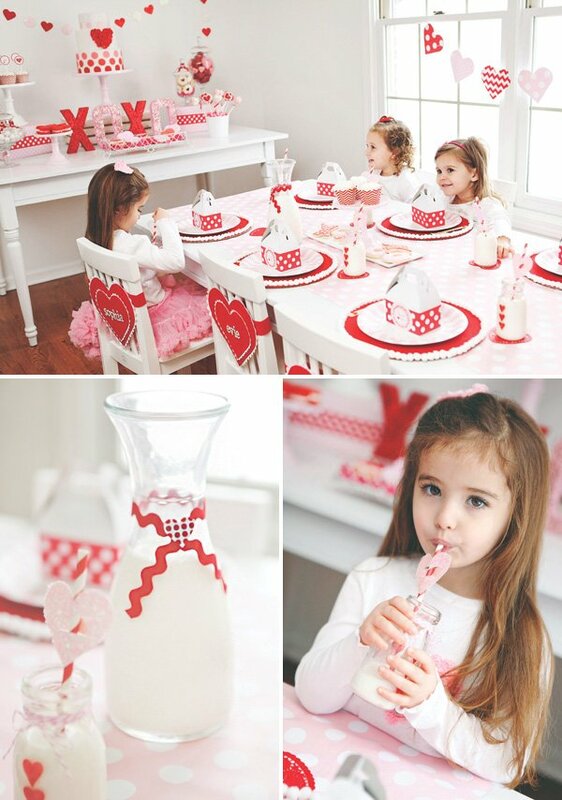 Becky Batchelor Photography captured all the pretty details and our even prettier little models! 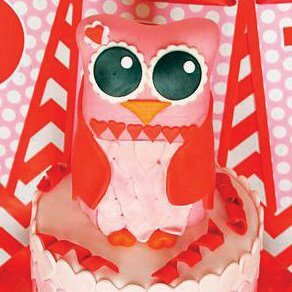 I went with a traditional red & pink theme, starting with a table runner made from our polka dot Party Paper in Pink Frosting. I added some sweet DIY plate chargers (made from a cardboard cake board covered with red felt and encircled by white pom poms). 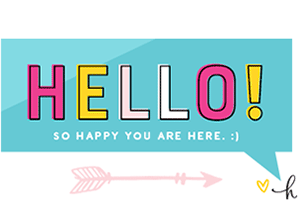 I used a pattern to cut hearts out of our Party Paper in both polka dot and chevron and secured them with ribbon to make a fun and easy garland to string across the window. 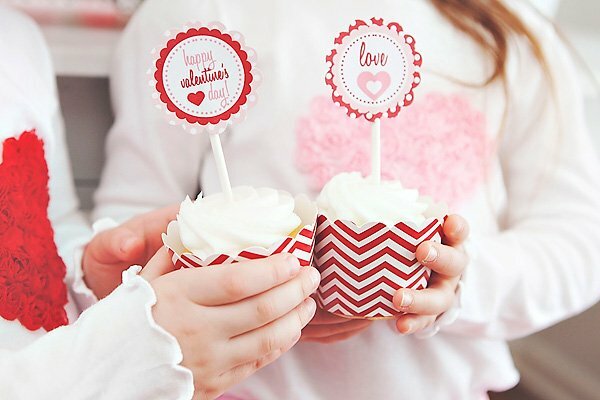 Our Simply Wood forks were stamped with a tiny red heart to carry out the theme, and simple favor-sized gable boxes were personalized for each of the girls with Party Paper Ribbon in Cheery Cherry and adorned with a sparkly gift tag. 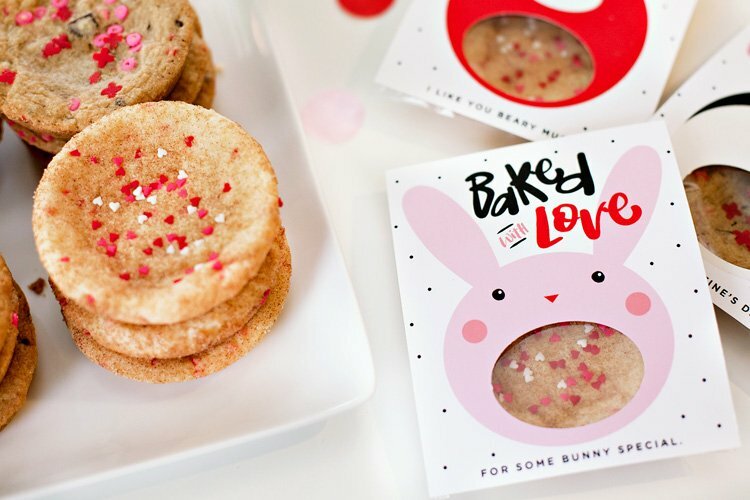 And speaking of sparkle, nothing says L-O-V-E like lots of glitter! 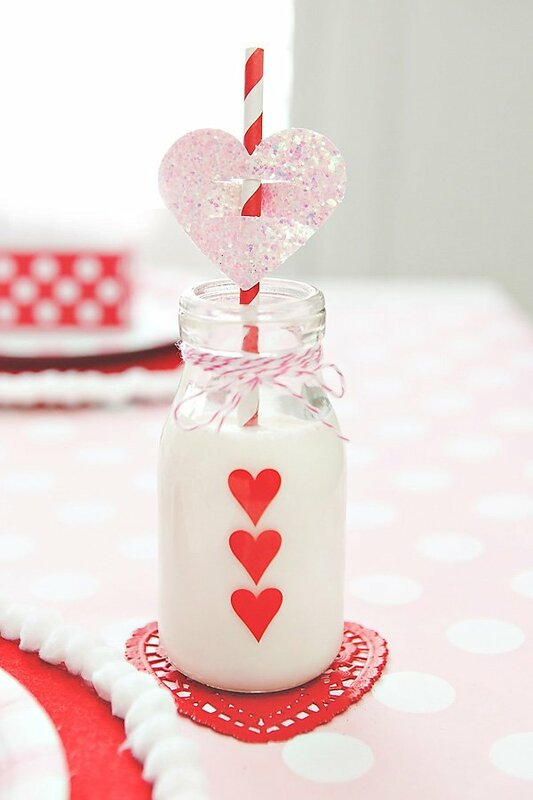 I found the most adorable glittered XOXO’s from Nicole’s Etsy shop, “Letters from A to Z.” I used craft punches and glittered card stock to make a simple but sweet garland behind the party table and also for straw toppers to make our Hearts Glass Milk Bottles even prettier. The gorgeous cake by The Topping Couture Cakes complimented the patterns used throughout the party perfectly. 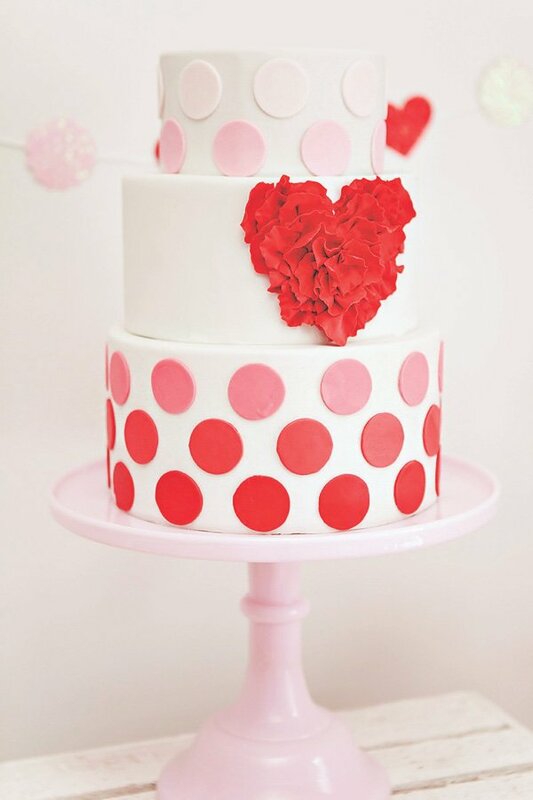 Erica decorated the cake with ombre polka dots, and finished it off with a ruffly heart inspired by the rosette tees the girls wore. 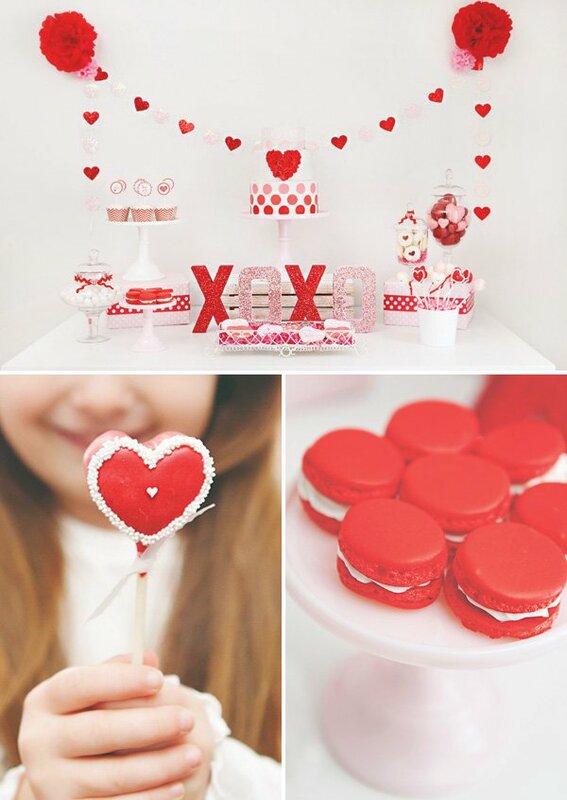 She baked up some additional love with pretty red macarons, XO cookies, strawberry heart tarts and heart-shaped sugar cookies decorated with more polka dots. 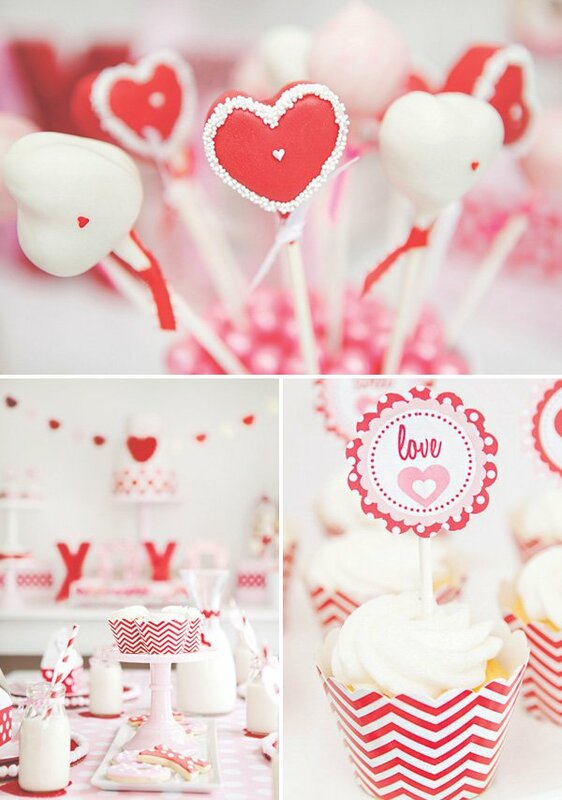 A favorite treat at any party, red and white heart-shaped cake pops by Sweet Peas Cake Pops were the very first desserts the girls asked for I made very simple Valentine card holders for each of the girls’ chairs with red felt and hot glue… super affordable and no sewing required! 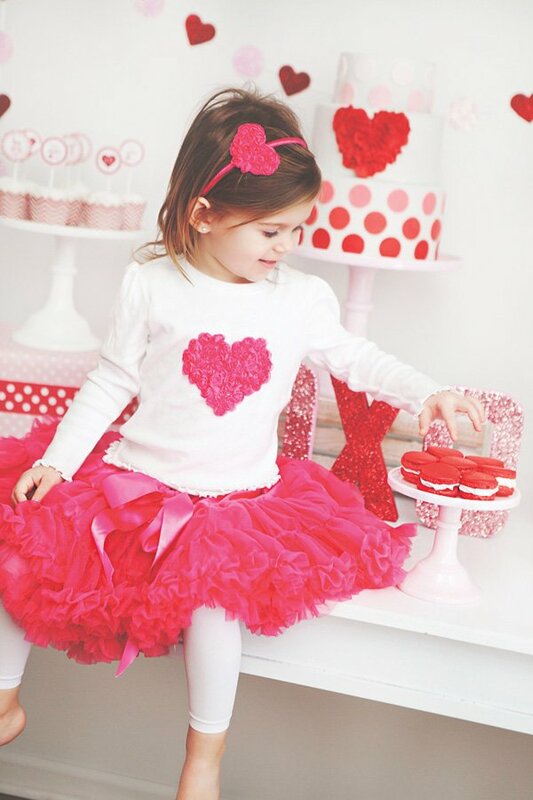 It is so much fun to watch little ones leave sweet notes and Valentine wishes for friends and family! 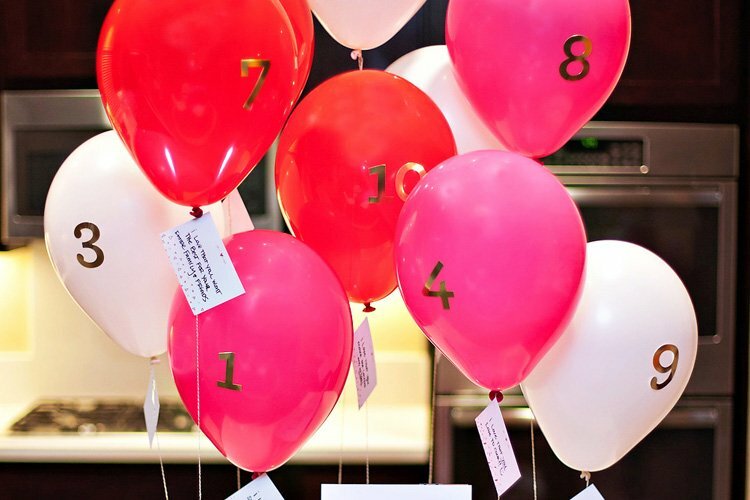 With a few party supplies and some simple DIY, it’s so much fun to celebrate Valentine’s Day and show some LOVE! 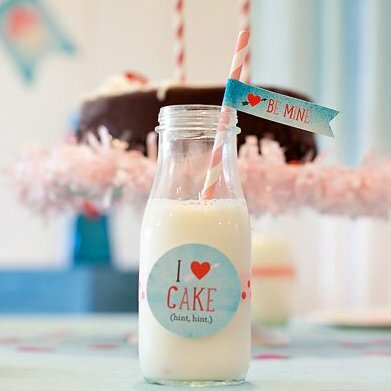 Party Styling & Concept: SmashCake & Co.
Party Paper, Party Paper Ribbon, Milk Glass Cake Stands, Hearts Glass Milk Bottles, Paper Plates, Paper Straws, Gable Boxes, Wooden Forks, Pettiskirts, Chevron Cupcake Wrappers, Shimmer Gumballs, Paper Poms & Twine: SmashCake & Co. So pretty! 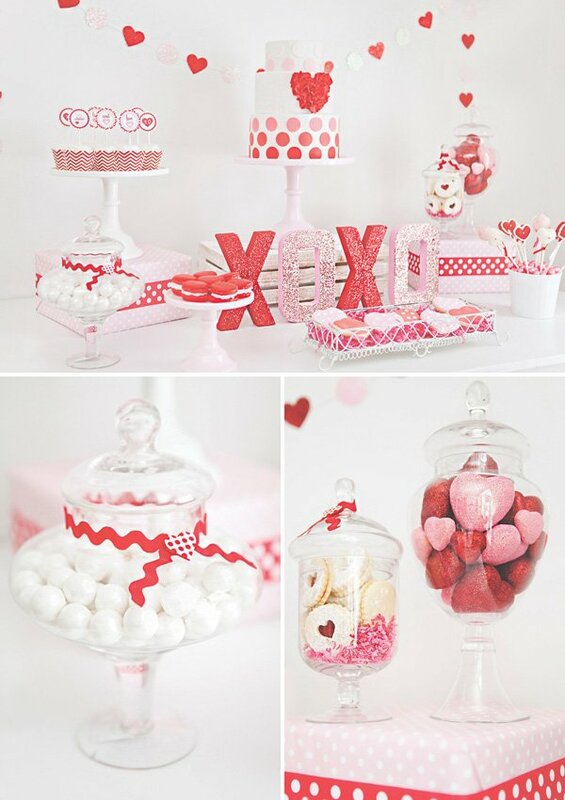 Loved the beautiful and inspiring details in red and white.